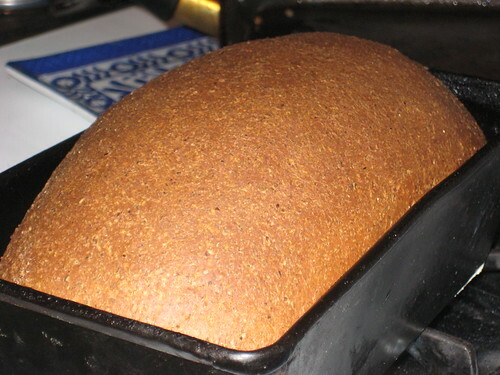 This afternoon I tried the recipe for Farm-Country Multi Grain Bread. Delicious! Heat the milk to about 115*. Pour the milk into the bowl of a standing mixer. Add the oats, sugar, butter and salt, and mix well, using the dough hook. Add the eggs and mix well. 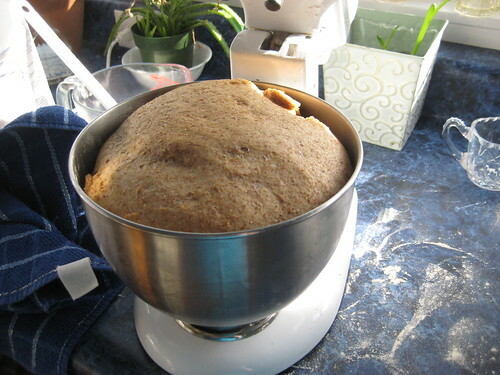 Add the yeast, wheat germ and whole wheat flour. Mix well. 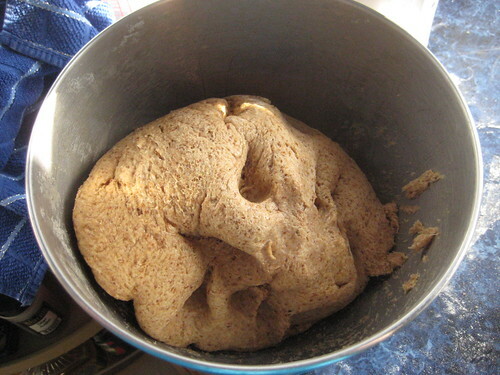 Add the remaining flour until the dough pulls away from the sides of the bowl. Knead for about five minutes. Pour a little oil into the bottom of the bowl and turn the dough to coat well. Cover with a dish towel and let the dough rise until doubled in bulk, for about an hour. 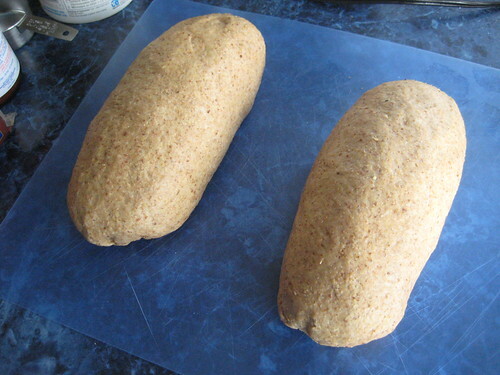 Cut in half and form two loaves. 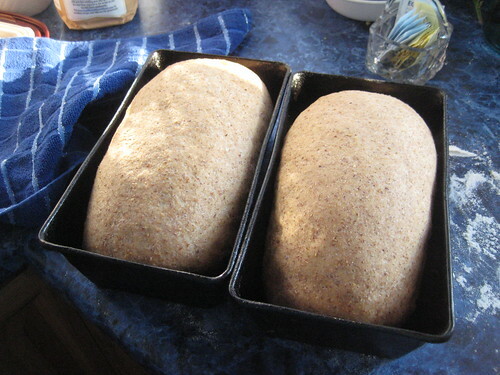 Place the loaves into greased loaf pans and let rise for about an hour, until doubled in bulk. Bake at 350* for 55-60 minutes. Turn out onto a cooling rack and cover with a dish towel to cool. 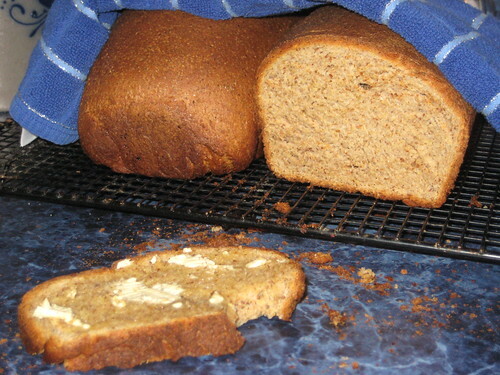 My bread turned out darker than the original recipe because I added milled flax seed in place of wheat germ. 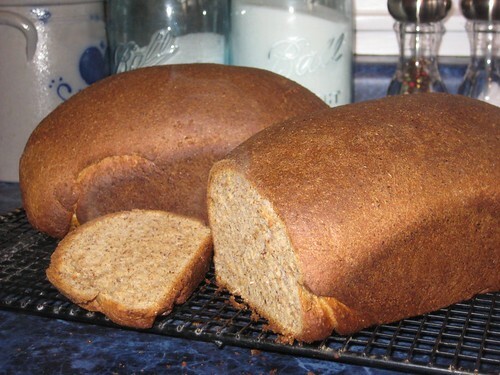 This entry was written by ~~Rhonda, posted on February 20, 2009 at 8:44 pm, filed under cooking and tagged multi grain bread, recipe. Bookmark the permalink. Follow any comments here with the RSS feed for this post. Post a comment or leave a trackback: Trackback URL. So true – now I know why you two are such good cooks! We bake asparagus like this: Prepare fresh aspargus, then drizzle olive oil and sprinkle parmesan cheese over top. Bake @ 400. Better than french fries! Your salmon, potatoes and asparagus reminded me of a meal we just had…same thing exactly. I also like to use creole seasoning on our salmon.